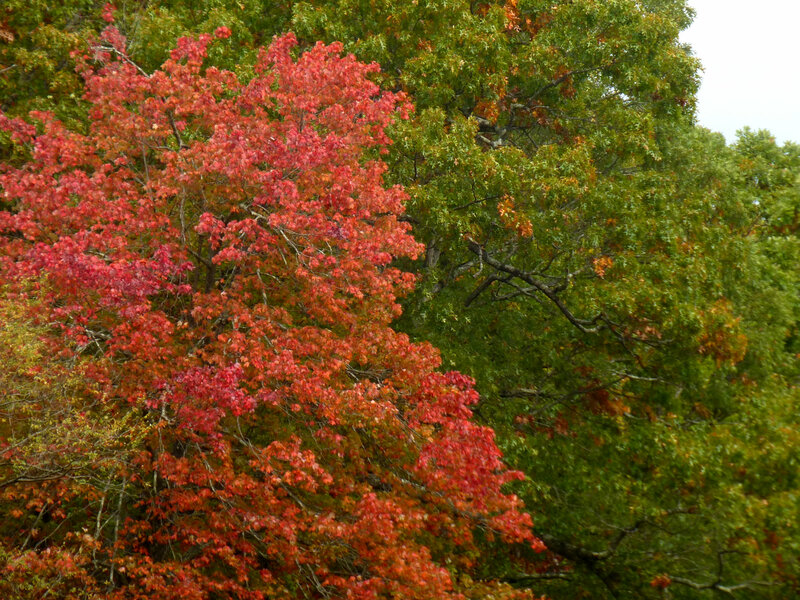 While peak color has ended in several areas above 3,500 feet, color remains at elevations below that, including the immediate Asheville area. We still have green leaves on our oak trees, in fact. Fall is going to linger on into November, yay! There has been a definite speeding up of fall color around Asheville during the past seven days, with maple trees and sassafras really coming alive with fire engine reds and brilliant oranges. Oak trees are also changing albeit at a slower pace. Still some green out there…but we expect the very late changers at our elevation (2,300 feet) to provide some great color going into mid-November. 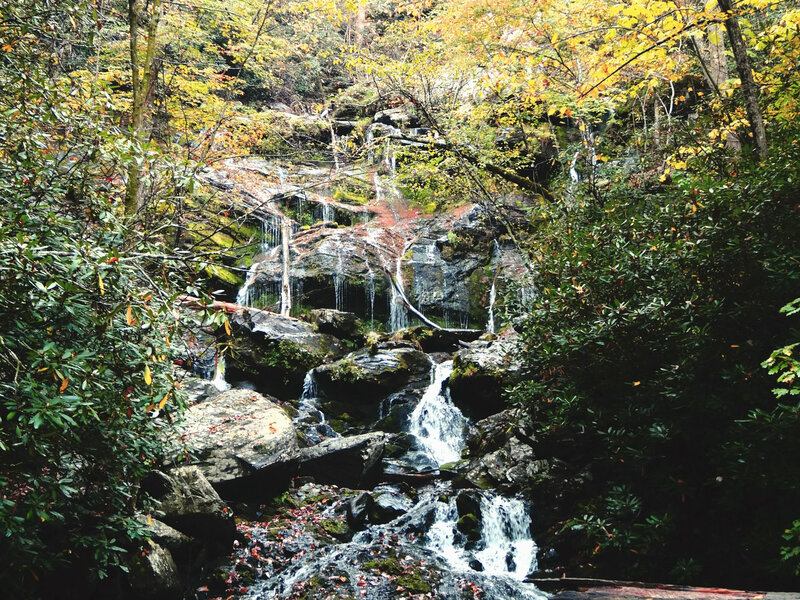 Fall Color Waterfall: This week, we recommend hiking to the base of Catawba Falls on the Catawba Falls Trail in Pisgah National Forest just outside of Old Fort. It takes about 20 minutes to get to the trailhead from the Inn on Mill Creek B&B. The Forest Service has been doing some improvements to the trail this year, including building some bridges on the trail at water crossings, making the trail more accessible to hikers. Walk in the Woods: Staying close to the Inn on Mill Creek B&B, we send you for a woodsy walk/hike on the Youngs Ridge Trail, accessible on one end at the Old Fort Picnic Grounds and at the other end via Kitsuma Ridge in Ridgecrest. This four-mile (one-way distance) trail leads up and along Youngs Ridge, which also doubles as a mountain-biking trail, so keep an eye out for mountain bikers coming down the ridgeline toward the Picnic Grounds. 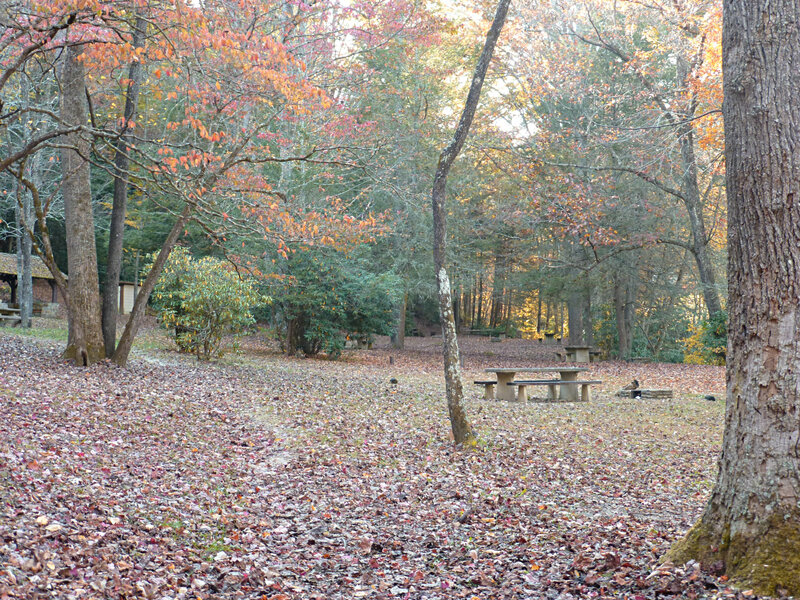 The Picnic Grounds themselves are awesome, so bring your lunch and have a bite before or after your hike. 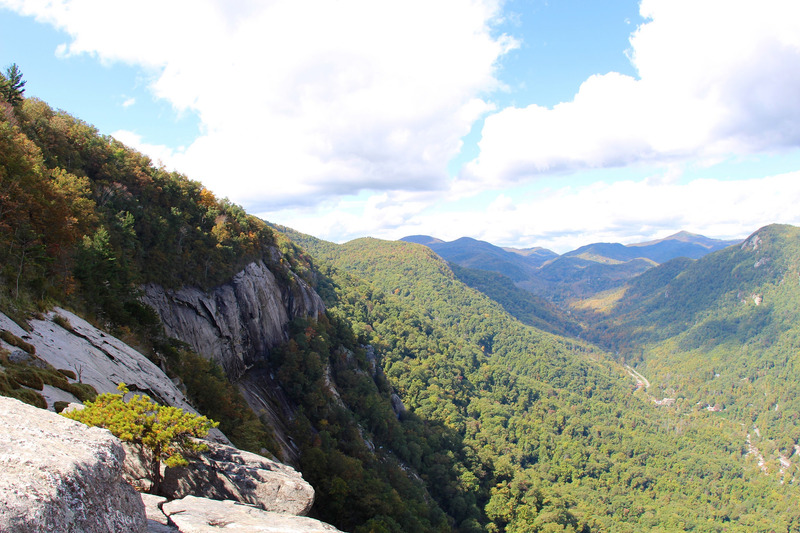 To a View: Head about 35 minutes south of the Inn on Mill Creek B&B to Chimney Rock State Park, where you’ll find the Exclamation Point Trail — it leads to the highest point in the park (2,480 feet), called, you guessed it… Exclamation Point. Chimney Rock State Park’s fall foliage peaks in early to mid-November, so this is a beautiful time to see the park. Take note that there is an entrance fee, and Exclamation Point Trail is accessed via the Outcroppings Trail, a series of stairs leading to and beyond the granite monolith that gives Chimney Rock State Park its name. 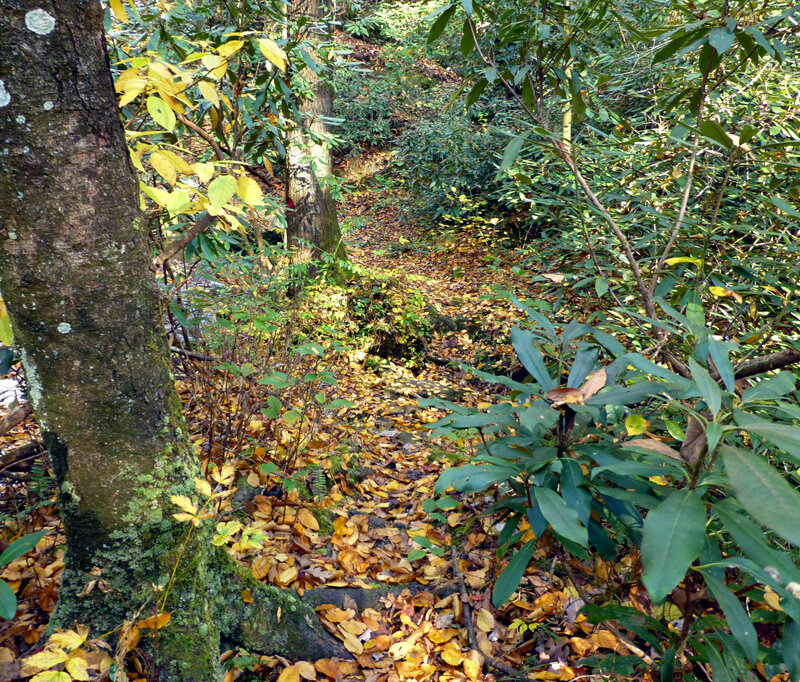 This entry was posted in Fall Color Reports, Fall near Asheville, Hiking and Waterfall Trails and tagged Autumn / fall foliage, fall foliage, hiking, outdoors, waterfalls by Inn on Mill Creek. Bookmark the permalink.